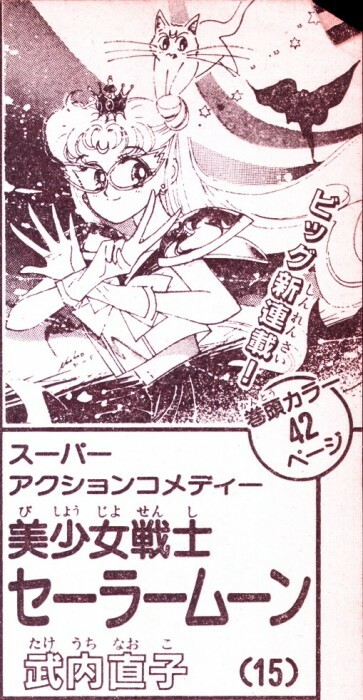 Let's not also forget these pages which depict what could have been a team Sailor V anime. I would love it if MementoNepenthe or someone else knowledgeable give us a full translation. The Soldier of Justice Makes Her Splendid Debut!! If Usagi was initially meant to become Sailor V in the spin-off...what happened to Minako? Part of me wonders if it was only going to be a team of four like in the original proposal with Usagi taking Minako’s place. But what’s even weirder is that Usagi’s name is clearly tied to the moon, and yet she still transforms into Sailor Venus? I’m also curious about Artemis. In the original proposal, there was going to be a fifth girl who was a princess named Artemis. Was she initially Artemis’ human form and Artemis was originally supposed to be female? I wish someone could sit down with Naoko and ask her about all of this. Having watched some of TOEI's magical girl shows from the late-1980s (Magical Chinese Girl Pai Pai! Magical Chinese Girl Ipanema! 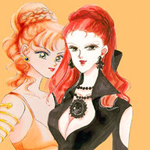 Bishoujo Kamen Poitrine), I think that Usagi simply would replace Minako... or they'd work together, but Artemis likely would not let them reveal their identities to each other. We can see that all of the characters are making the V-sign. The speech bubble text is the same as from the earlier ad. 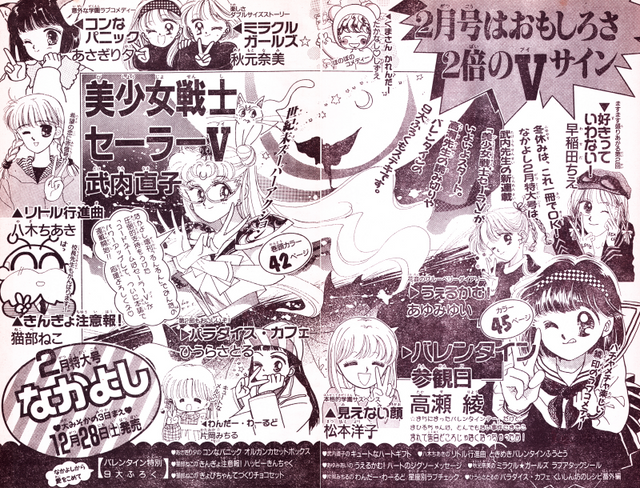 Elsewhere on the page is text saying "Takeuchi-sensei's new series is finally starting." Anyway... With all those V-signs, it definitely feels like they're making a big deal about Sailor V becoming a series, which really does make one wonder why Naoko replaced Minako with Usagi, and then later changed the series from Sailor V to Sailor Moon. But it's that "Two Times the V Sign" tagline that intrigues me. Was that just some kind of marketing nonsense? (It's not like the February issue was a "V-sign" themed issue. Sailor Moon makes the V-sign on the front cover, but I didn't notice any other characters doing V-signs throughout the issue.) Or was it a clue as to what the series would involve? We can already see Usagi was going to have at least 2 (if not 3) Sailor V uniforms... Maybe there would be multiple "pretty soldiers" using the Sailor V codename? Kind of like what they're doing with Batman in the comics right now? Someone needs to ask Naoko about this if/when she comes to America. ^ I also wonder whether that relatively rushy & substantial change is entirely her idea or even her idea at all. Did a bit more sleuthing. This poster, which was one of the giveaways for the January 1992 issue of Nakayoshi, is dated November 5, 1991 - the same date as that character description page. So at that point Naoko either seriously intended for Usagi to carry a gun, or she really had no idea what she wanted to do story-wise. 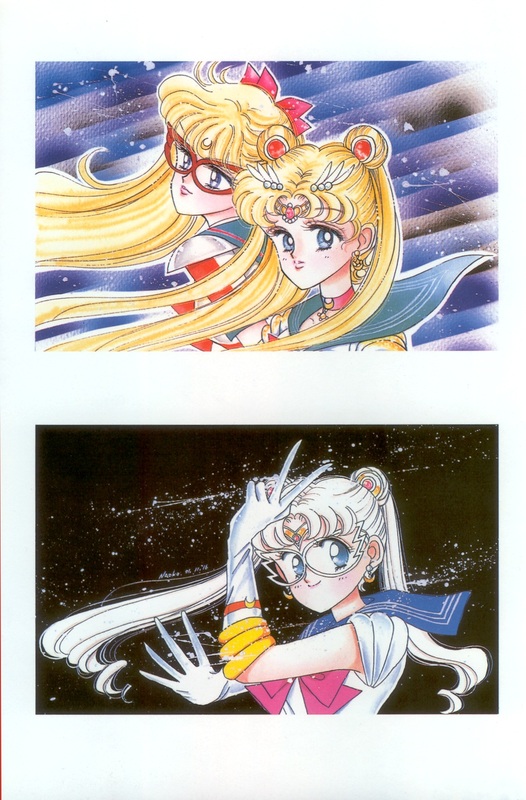 The next earliest dated picture I could find was this one (the bottom one), which was used as a telephone card design for the February 1992 issue of Nakayoshi. Naoko captioned the picture by writing, "I drew this before the serial, when I was still wavering on the costume. The face is also different." As we can see, Usagi here looks like Sailor Moon, only with silver hair. She looks far different than she does in all the promo art in the January issue. But look at the date: November 16, 1991. 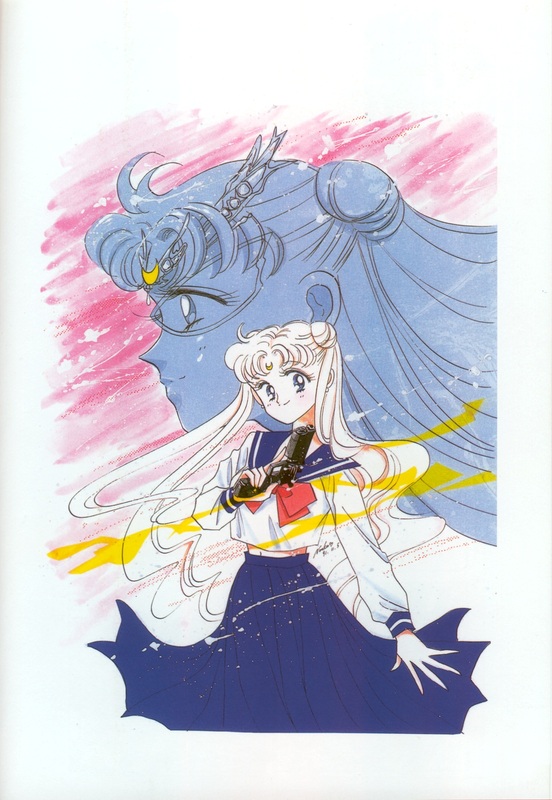 November 5, 1991 ---> Naoko is developing her "powered up" version of Codename: Sailor V under the title Pretty Soldier Sailor V, starring a potentially gun-wielding Usagi as the title character instead of Minako. My guess is the deadline for last minute changes had already passed by the 16th, so it was too late to update the ads and interview with the new title. So at that point Naoko either seriously intended for Usagi to carry a gun, or she really had no idea what she wanted to do story-wise. I don't think she ever planned on having Sailor Moon carry a gun. She probably saw a pretty girl holding a gun in a magazine or something and thought it was cool so she recreated the pose for her illustration. Another weird thing is there's an ad in the February 1992 issue for some prize giveaway thing. The top prize is a Super Famicon with a copy of Super Mario World. The prize is labeled the "Usagi-chan Prize" but the picture used is of Minako! So it seems from the very beginning this franchise wasn't treated with the greatest of care. ETA: Can anyone help me figure out what 期待度二重丸!! means? It's written on the telephone card (along with the "End of the Century Super Action!!" tagline) and Google etc. aren't being terribly helpful. It seems to have the word for double in it, so I wonder if it might somehow relate to the "Two Times the V Sign" tagline discussed above. I remember that! Wasn't that from Act 5? google translator say for 期待度二重丸: the double circle of expectation or expectations double circle. Maybe a reference for Usagi odangos? Yup. And more accurately, that's in her day dream while she was awake, not in her dream while she was asleep. My take is "doubled degree of expectation." I hadn't noticed this from the two-page spread version of the picture above, but it's also dated November 5, 1991. Either that was a very productive day for Naoko, or it was just the day she finished and dated a bunch of old art work, and thus might not be all that helpful in terms of constructing a timeline. I also find it interesting that the series is described as a "Super Action Comedy," though I suppose that's apt for Act 1 given the more serious dramatic parts don't come until later. I’m more distracted by Usagi’s awful anatomy. I guess we know where Crystal got its inspiration from. 1. Decided to rename this thread to expand the scope of conversation a bit. 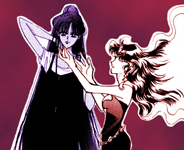 Moon: Let's do this, Tuxedo Mask! Tuxedo: Hahaha, you think you can beat me? 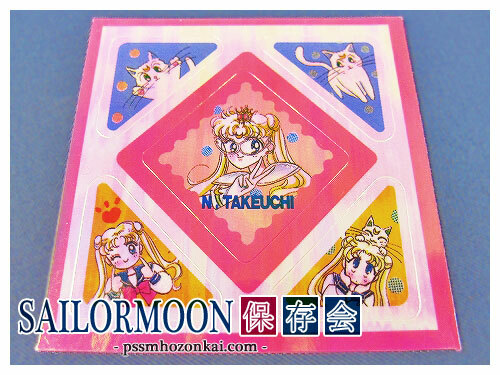 Found this "rainbow seal" sticker set from the March 1992 issue, featuring some cute, color artwork of Usagi!Sailor V and Artemis.